29/08/2018 – Since my last update I have been working on the final new livery for the Duchesses (other than the Streamliners if I ever build them) BR17A BR experimental dark blue with LNWR style lining. From descriptions I can find it was similar to LNER Garter blue so not really that dark at all. Only a few Polmadie (Glasgow) based Duchesses ever received the livery, some of which I can’t yet model because they were ex streamliners and still had the curved smokebox top. But three I can model and will be doing two or maybe three of those. The Duchesses that received BR experimental dark blue were 46224/46227/46230/46231/46232/46241. I hope to release this livery & LM29A LMS experimental blue/grey within the next seven days. Since I released the last batch of Duchesses in wartime black & BR standard blue I have noticed that the texture for the cylinders cover at the front of the locomotives is wrong so I will also be repairing this and if you have bought any of these loco’s then please get in touch and I will send out repaired versions shortly. As shown in the screenshot below, the left locomotive’s textures are wrong and the other two with the different style of cylinder covers are right. I’m not sure if all the locomotives I released at the time are wrong but I think they will be. 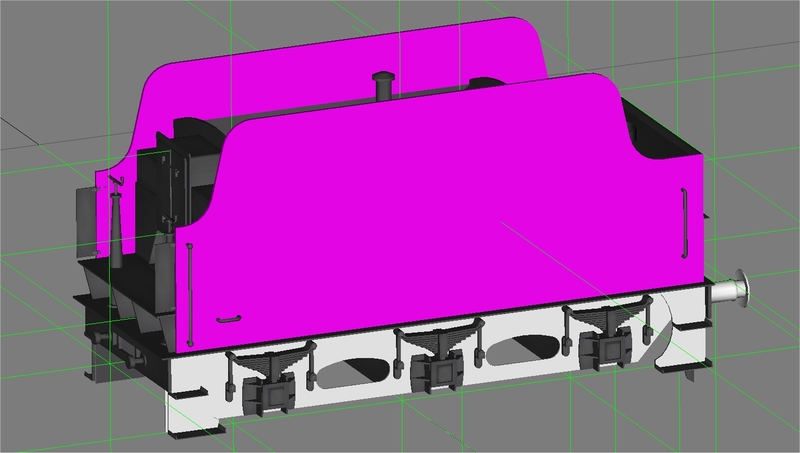 My next plans for the Duchesses are to produce either the sloped smokebox front versions and/or the first five Duchesses which I haven’t done so far as they have a few differences from the others most noticeably the outside cylinders. I’ve also been working on the high sided tender and here is a screenshot of progress so far. Red parts are mostly new with a few updated and yellow parts are yet to be looked at. I am also working on the Patriot rebuild but no progress on that since my last update. 12/08/2018 – The rebuild of 6234 is now complete but I’m having a break from it before I release it as I need to check over everything on the mesh and textures in game in case there are any issues and from past experience it’s best to have a while away as you can miss obvious mistakes otherwise. I also still need to do the BR darker blue livery for these locomotives. In the mean time I have started work on a full update of the Patriots which are now 15 years old (scary!) and other than a few changes here or there are pretty much the original model. I am working through the whole model so all new textures and every part of the mesh will be checked and if necessary replaced or modified. The drawings I worked from for this model aren’t the most accurate so I’m spending a lot of time checking photographs to see what is right/wrong with my model and modifying where necessary. I am working on the LMS crimson lake livery first as it is the most complex then once that is completed I will update BR lined green and add some new liveries – BR lined black, LMS express black and LMS wartime black and possibly another version of LMS crimson lake (1936 style numbers). So far I have replaced the skirts, steps, step supports and created new textures for the cabsides and cabfront (still working on all the rivets! ), skirts, front buffer beam, splashers, step supports and buffers. I will be replacing the cab front as the windows are wrong plus modifying the roof edges. Plus adding quite a lot more detail to the valve gear, cylinders and various equipment located on the locomotive. I’m also planning to do quite a lot of redesign work to all the wheels as I think they let the model down more than anything. I plan on adding some cab detail too. Some screenshots below of progress so far. 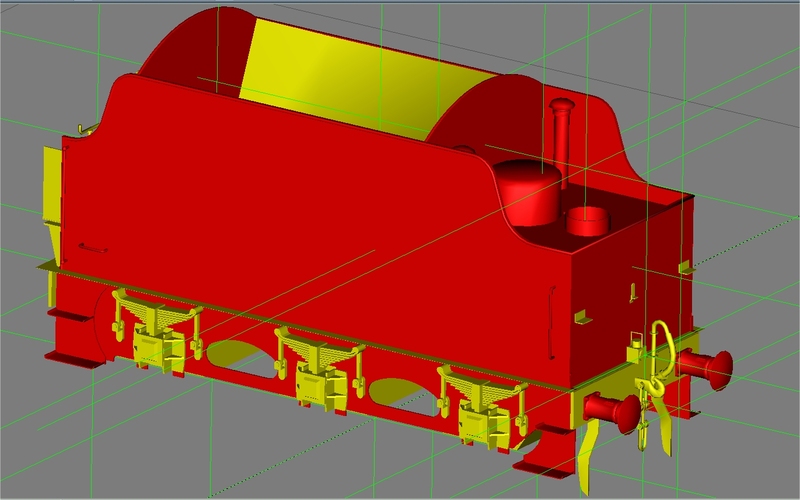 Another project I have started is a model of the high sided tender. Only ten of these were ever built, originally for Jubilees 5607 to 5616. Production then changed to the Stanier 3500 gallon tender. These tenders are very similar to the previous Fowler 3500 gallon tenders. When the last batch of 40 4F 0-6-0’s were built from 1937 to 1941 they were built without tenders. The LMS built a separate batch of 40 standard Stanier 4000 gallon tenders which were fitted to various Jubilees replacing a mixture of Fowler and high sided tenders. As a result seven of the high sided tenders transferred to new 4F 0-6-0’s. The remaining three tenders (4569/4570/4573) eventually moved on from their original locomotives (5612/5613/5616) but were coupled to a mixture of locomotives including Jubilees 45568 & 45719, Patriots 45505, 45515, 45539, 45550 & 45551 and at least one 8F 2-8-0 48600. I plan to use these tenders in LMS crimson lake with Jubilees and BR lined green and BR lined black with Jubilees and Patriots and possibly LMS and BR plain black with 4F 0-6-0’s. 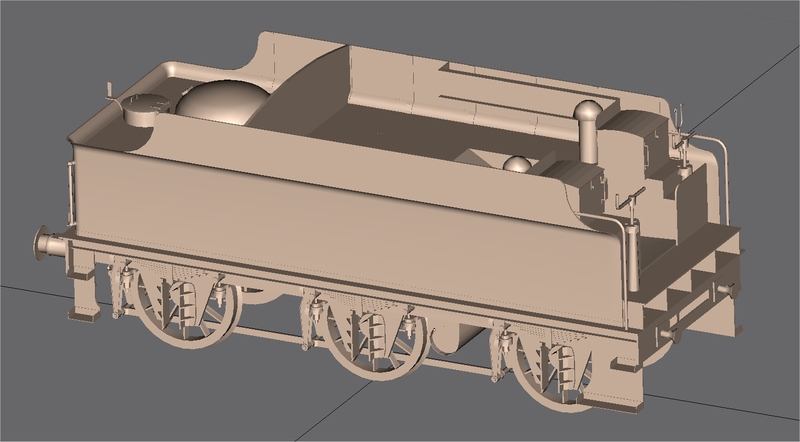 It is still very early stages for this model as even though it is largely based on my existing Fowler 3500 gallon tender I will be giving the mesh and textures a full update. A screenshot of the work so far is below. 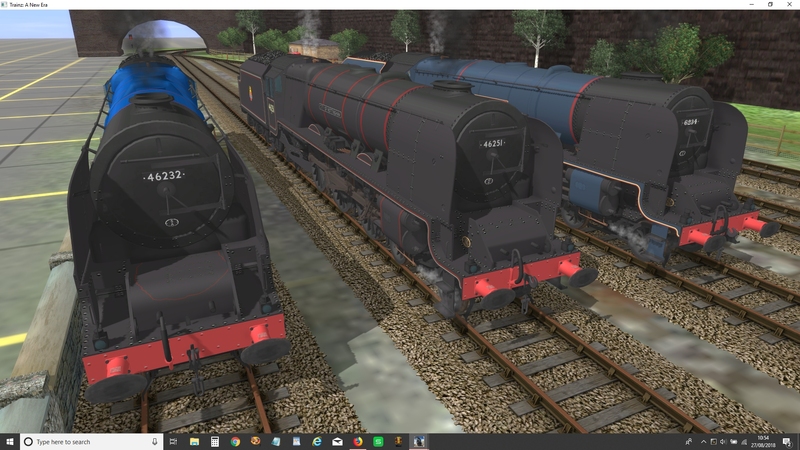 29/07/2018 – I had a few months away from Trainz but have been busy with things again this week. 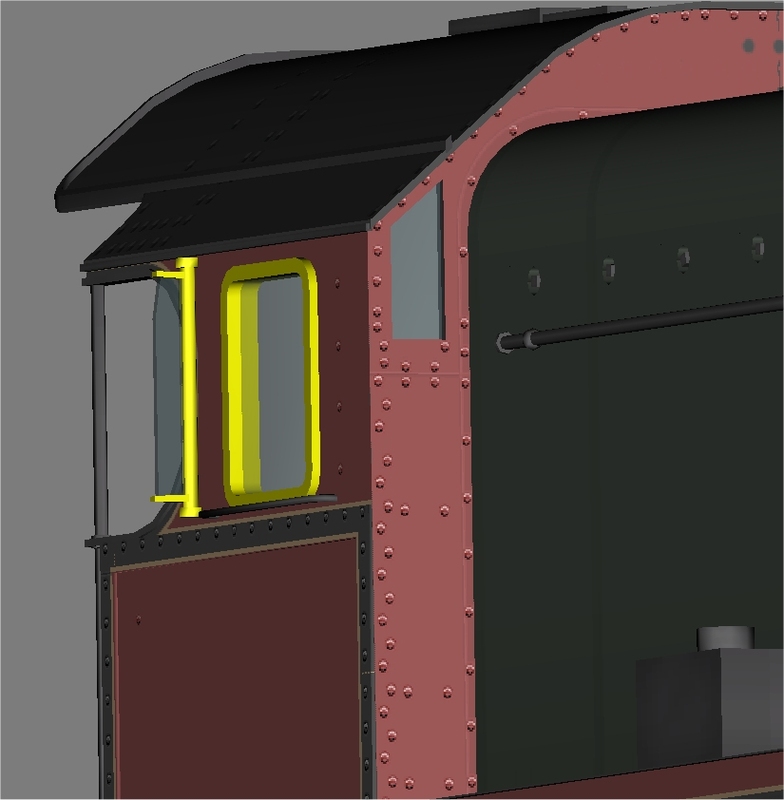 The main mesh for 6234 is now converted from 3ds max to Gmax but there is still the lower detail mesh to do. Hopefully that won’t take too long. Everything else that I can see for 6234 in LM29A livery is now complete. 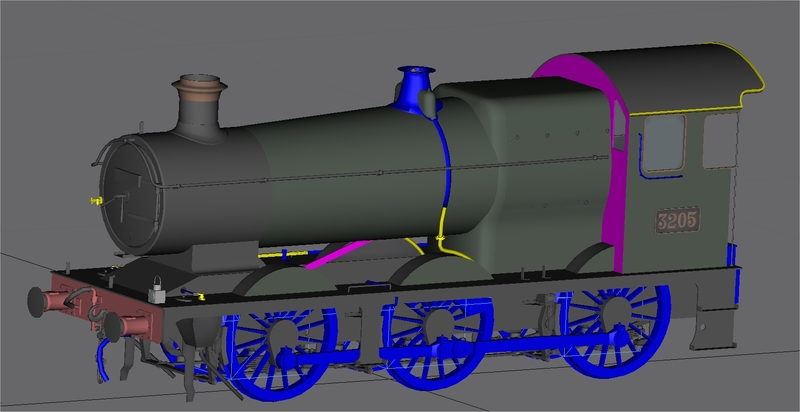 I have also been doing some work on the GWR 2251 0-6-0 but it is still a long way from completion. 16/04/2018 – Work continues on converting the Duchess mesh from 3ds max to Gmax. Patriots – new liveries BR2AZ/BR3AZ/LM15AZ/LM31AZ. Some new locomotives including 5551 Unknown Warrior. 10/04/2018 – I am currently still working on 6234 Duchess of Abercorn in LM29A Experimental LMS Blue/Grey livery. But I have come across two issues that I can only resolve by editing the mesh and unfortunately the Duchesses were originally built in 3ds max. I no longer have access to 3ds max so I am having to convert the mesh to gmax which is going to take a few weeks at least. I’m also taking the opportunity to do a few minor updates to the mesh but it won’t be enough to mean I will be updating all the Duchesses. Only the ones I am working on at present. I have also established that the earlier experimental darker blue carried by a few Duchesses in early BR days (1949) was similar to LNER Garter blue. The screenshot below of 46233 is a test colour which I think looks quite close. The lining will be quite different on the final models. And finally, if I ever finish it, a couple of screenshots of my next new locomotive that I have been working on for a very long time.